Socialite, philanthropist, and proprietor of IfOnly.com Trevor Traina posts loads of impressively artsy pictures on Instagram. Occasionally, he’ll grace us with a blast from the past. Monday, Traina offered us this diamond of a photo. No, that’s not Laura Linney in a Lifetime Afternoon Movie about maids who steal things. This is a photo of THE DeDe Wilsey when she was like, your age. Why are you not being photographed like this, gazing at a Renoir while your children drool Vittel? IfOnly indeed! 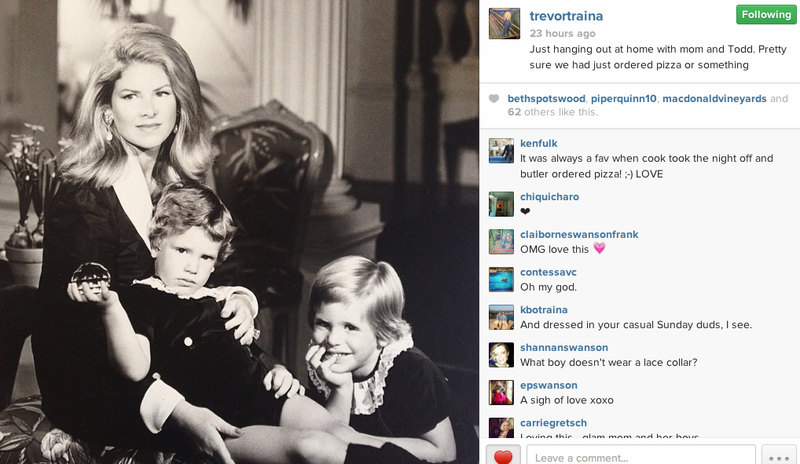 What do you think of Trevor’s caption? At first I was worried Trevor was making fun of poor people for ordering pizza, which is obviously what rich people think poor people eat. But I’ve since decided that he is instead mocking the elaborate and dramatic photo-shoots of his childhood. Because we all know that there was no pizza. This photo was followed by 3 dainty spoonfuls of caviar or some Grey Poupon. Good little boys who don’t get food on their velvet and lace dining ensembles will get 1/3rd of an After Eight for dessert. If you don’t know who these people are but wish to care for some reason, read this 2007 article from W Magazine and PICK A SIDE.